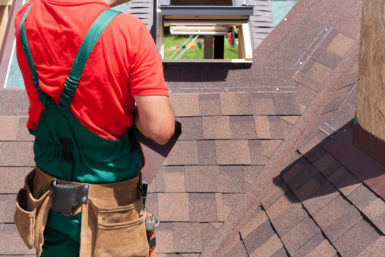 A leader among the residential roofing repair companies serving the Glen Carbon, Illinois area, Daech & Bauer Roofing offers the service and craftsmanship that homeowners are looking for. We’ve completed more than 10,000 projects in the region, and our technicians have the experience needed to return you roof to peak condition. Additionally, we only use products from top manufacturers such as Owens Corning™ and CertainTeed, so you know your roof will be built to last. We’ve spent many years helping homeowners navigate the confusing insurance claim process following storm damage, and can provide assistance to help ensure that you receive the necessary compensation to adequately cover your roof repairs. We will be present at your roof inspection to make sure all damage is properly documented, and we will also submit any needed claim supplements so your roof can be repaired in full and returned to optimal condition. And, once your repairs are completed, we will back our work with a five-year labor warranty. Contact Daech & Bauer Roofing today for all of your residential roofing repair needs. Be sure to ask about our “apples to apples” price guarantee, which states that we will match any competitor in the Glen Carbon, IL area that offers the same work for a lower price.